In Buddhism is Thailand's main religion. Buddhism is closely tied to the Thai nation state and its royal house. If you've ever visited Thailand you have not been able to miss this fact; the beautiful Buddhist temples are everywhere and occupy some of the most visible and central places in Thai cities and countryside. And many of these temple feature beautiful statues, carvings and other images of elephants. Why? Buddhist mythology has it that some 2500 years ago in Northern India, there was a king called Suddhodana whose wife was Queen Maya ('vision'). She was renowned for her intelligence, virtue, and beauty. One night Queen Maya had a dream, in which she was visited by a white elephant. The elephant held a lotus flower in its trunk, and after circling her three times, entered her womb. The next day, knowing that the message she was given was important, Queen Maya told the king, who sent for wise men to explain the dream. The message was clear, the wise men said: Queen Maya was chosen to give birth to a child that would be a great being. That child was Prince Siddhartha, who would go on the become Buddha. And so it is that Thai Buddhists today believe that walking around an elephant three times brings luck and helps make prayers come true. It's also the reason why particularly the white elephant takes an important role in Thai culture and symbolism. All white elephants in the Kingdom are the property of the king, because of this divine status. History has it that the King of Siam (before it was named Thailand) would reward nobles by giving them a white elephant and accompanying lands to be able to take care of the elephant (elephants eat about 10% of their bodyweight a day). However, if the king wanted to signal his displeasure with someone, he'd give them a white elephant but without the means to take care of it. Because of the 'gift' was not allowed to be put to work, and because the recipient was honor-bound to take care of it, they could go bankrupt doing so. And so, as a figure of speech, to 'give someone a white elephant' means to give someone a burdensome, costly gift that is hard to get rid of. Lore has it that when the elephant of the King Mangrai of the Lan Na ran off in 1262, the king tracked it to the banks of the river Kok, where he then decided to found the city of Chiang Rai. King Mangrai continued his search for a place to found his new capital city, on eventually rode on elephant-back to the slopes of Doi Suthep, where after receiving a favorable omen, he built Chiang Mai (finishing its construction in 1296) which would henceforth be the capital of the Lan Na Kingdom. it's recorded that the same year, King Mangrai fought and won a fierce elephant battle against the troops of Haripunjaya's ousted King and son. Over a century later in 1383, another Lan Na king, Keu Naone, was given a relic, thought to be a bone of Buddha. The bone broke in two and the king placed one bone on the northern gate of Chiang Mai (called Chang Puak - white elephant). He tied the other on the back of a white elephant that he sent into the wild. The elephant walked up the slopes of Doi Suthep and after trumpeting at the summit, died. 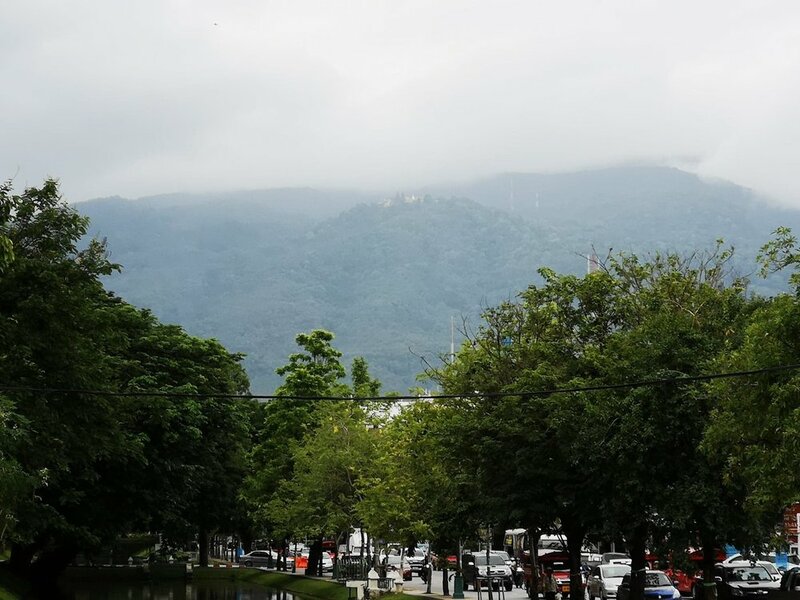 At this spot, the king built Wat Phra That Doi Suthep, one of the most famous temples in Thailand. Just as warhorses played an important part in early Western military history, so did elephants in that of the history of Thailand and its predecessors (the kingdoms of Lan Na, Sukhothai and Ayutthaya). War elephants were used as shock troops to intimidate and charge the enemy ranks at the onset of battle, causing panic and chaos. These elephant regiments could number into the hundreds of elephants, which were also employed as beasts of burden during military campaigns. Elephants were mounted with a howdah, a wooden construction that can be occupied by up to three soldiers, one of which would direct the elephant using an iron hook. The so-called bull-hook's use survives today, although it is now increasingly criticized. The history of Sukhothai features the first (though disputed) Thai mention of elephants in battle. It's a description of a duel between Prince Ramkhamhaeng of Sukthothai and Khun Sam Chon, ruler of Muang Chotm, during a larger battle. Ramkhamhaeng won, and as king would go on to gain fame for his fighting prowess on elephant-back. He would ride his white elephant Rucagri to pay homage to Buddha at the local temple, twice a month. He would go on elephant rides with his friend the King of Phayao to the river Mekong, and wash their hair in it according the La Na custom during Songkran. Probably the most famous account of the elephant's use as warrior companion in battle is that of Prince Narusuan of the Kingdom of Ayutthaya. During the mid-1600s the kingdom had become a tributary state to Burma. The 'black prince' Narusuan fought a number of wars to secure Ayutthaya's independence. In January 1693, his forces met with a Burmese invasion force. Thai lore speaks of Narusuan taunting the Burmese prince Mingyi Swa into a one-on-one duel, which he narrowly won by killing Swa. Other accounts describe Narusuan's elephant unit becoming surrounded but a Burmese elephant being in musth, causing chaos among the Burmese troops. This then allowed one of Narusuan's Portugese soldiers to fatally shoot Swa. Interestingly, in many of the accounts the high status of these royal elephants is shown in that historians recorded their names. Many of these battle-histories mention elephants going 'in musth', which means that a male elephant is in an aggressive, sexually active state. During musth, temporal glands on the side of the elephant's head produce a tar-like fluid that is rich in testosterone that flows into the mouth. Not everything is known about how musth works in elephants, but an elephant in musth can attack other elephants, wounding and even killing their own family members and calves. Working with male elephants in captivity is therefore extremely dangerous during this period, which can last over a month. In Thailand the mahouts, the closest human caretakers and companions to the animals, usually confine the elephant in a small enclosure and chain them. Not doing so would certainly result in their deaths or those of others. During the times of the Lan Na, Sukhothai and Ayutthaya kingdoms, wild elephant herds roamed the plains of what later would become Thailand. Even by 1900, during the time of the Kingdom of Siam, their numbers are estimated to have been over 100.000. During these centuries and into the 20th century, elephants were captured and used for many other purposes besides warfare, from logging, construction, to entertainment. When foreigner dignitaries visited the kingdom of Ayutthaya in the 17th century, they reported that the royal court organized elephant treks that included hunts from elephant-back for them. Human settlement and industry quickly ate away the natural habitat of the elephant. Elephant bulls were hunted for their ivory, and wild elephants were treated as pests and shot by farmers. And so the number of wild elephants in Thailand quickly dropped in the 20th century. By the 21st century, the numbers of wild elephants in Thailand are estimated to be between 2250 and 1700 animals. Similarly, domestically kept elephant numbers also declined drastically. The introduction of motorized vehicles around 1900 in time largely replaced the use of elephants as a mode of transportation. The number of around 100.000 eventually dropped to about 3000 animals. With the rising popularity of elephant camps in the last two decades though, numbers of elephants have gone up, due to Thais legally and illegally importing animals from the surrounding countries. The often-used term 'domestic elephant' is a bit misleading, because they are not domesticated like cats or dogs. Elephants have not been bred for particular traits and therefore remain wild and able, under the right circumstances and preparation, to live in the wild. Some elephant sanctuaries such as Into the Wild Elephant Camp in Chiang Mai try to teach their elephants the necessary skills that will allow them to survive in the wild and that they can pass on to their young. For example, by teaching them which self-medicating plants they can eat. In the 20th century, many domestically kept elephants were owned by villages that leased their services and those of their mahouts to logging companies. In 1989 and without much warning, the Thai Government banned logging in Thailand. This put these elephants and their mahouts out of work and the ability to pay for the elephant and village's upkeep. Mahouts had during the centuries lost much of their status. Where the elephant units of the ancient armies had very high standing in society, by the end of the 20th century the profession had become one of low status and low income. With the 1989 Thai logging ban, the mahouts had little options. Many of them started to work (often illegally) in the logging industry of Myanmar, or in the tourist industry. Many ended up having their elephants doing tricks for money, or even begging in the streets of Bangkok. 'Others ended up giving rides at trekking companies. In recent years, elephant tourism has seen an important shift. Especially Western tourists have become more sensitive to animal welfare and some have started shunning those camps that don't take good care of their animals. Some in the industry have also started promoting the welfare of the mahouts to invest in a more sustainable industry. Elephant camps that take their moral responsibility seriously by taking elephants out of a bad situation are called elephant sanctuaries. Elephant sanctuaries don't offer elephant rides, try to retain and train mahouts over longer periods of time and try to give their elephants good medical care and as much freedom as reasonably possible, such as at the earlier mentioned Into the Wild Elephant Sanctuary. The mahouts are trained to manage the animals using voice commands and simulated elephant calls, instead of using a bull-hook. Other examples of good elephant sanctuaries around the Chiang Mai area are Happy Elephant Home and particularly Maeklang Elephant conservation community, where the elephants get to roam free in the vast Doi Inthanon National Park. If you would like to read more about elephant sanctuaries, read our blog about the top 3 elephant sanctuaries in Chiang Mai. At PM Tours, we take pride in offering only the best elephant sanctuaries.